Preliminary studies have revealed that the extracts and juices from pomegranate could fight against cancer cells in the body, without causing any harm to normal cells. Natural Health, also reports that the fruit is packed with polyphenol, an antioxidant, which help fight the oxidation process. Pomegranate extracts fight DNA Mutations that could lead to cancer. The fruit produces a cancer-fighting protective enzyme known as paraoxonase-1, or PON-1 – which prevents the oxidative stress and inflammation that could cause mutations. In cases where a DNA mutation does occur, pomegranate extracts can fight the replication of cancer cells, cause programmed cell death in mutated cells, and hinders the development of blood vessels that support and nourish tumors. 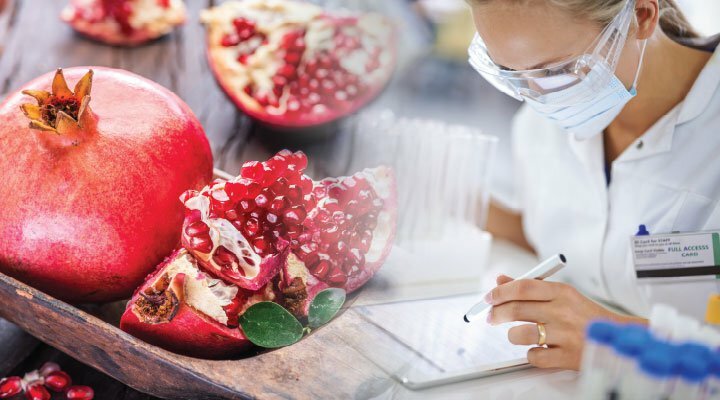 Even when a malignant mass somehow develops despite all this, pomegranate extracts could prevent its infiltration into local body tissues, and prevent its metastasis into more remote locations in the body. A study also recommends a cup of day of pomegranate juice to lower inflammatory markers in diabetic patients. When scientists studied the effects of this fruit in animals, it was found that pomegranate extracts reduced the number of lung cancer tumors by as much as two-thirds. The researchers found that the extracts repressedmovement, invasion, and spread of cells in non-small cell lung cancer. They also inhibited the levels of matrix metalloproteinase (an enzyme that aids the cancer cells to attack healthy tissue by breaking down the matrix between the cells. Finally, pomegranate extracts were found to be an “effective and safe chemotherapeutic agent” against non-small cell lung carcinoma. Pomegranate also has been shown to significantly reduce both the volume and quantity of colorectal tumors. Natural News, suggests a few ways to select and eat the healthiest pomegranate fruits. The heavier the fruit, the juicier it tends to be on the inside. The pomegranates which feel heavy for their size would have the most juice. Pomegranate seeds, also known as arils, contain a lot of nutrients like zinc, calcium, puninic acid, and selenium. To get the best health benefits from them, they are best eaten raw. Alternatively one can extract the juice for drinking. For those who for some reason cannot eat the fruit on its own, pomegranate seeds can be added to salads or yoghurt to boost nutrition.